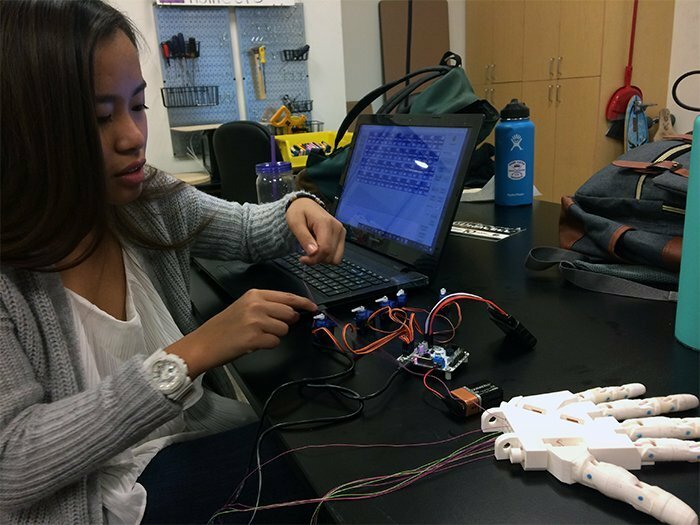 Denisse Delos Santos checks the connections of a 3D-printed prosthetic hand, a project of the Research and Design Program’s 3D printing biotechnology group. It started with a problem a world away. A student from Rwanda told his fellow Grand Canyon University Research and Design Program team in the College of Science, Engineering and Technology about his mother, a nurse, who works at a clinic in his home country, a high-poverty, developing region whose medical professionals wage a battle daily against malaria, Hepatitis A, yellow fever and other diseases. But one dire need stood out to the team of students who are part of the RDP’s 3D printing biotechnology research group. “We reached out to a lot of the local doctors, just anybody in the medical field, and said, ‘Hey, what are some devices that we can make better for you?’” said Ben Encinas, CSET’s lab supervisor and the group’s faculty mentor. The team had an idea. Why not use 3D printing to make low-cost prosthetics? It would be the perfect project for the student researchers and one that fits into GCU’s principle of servant leadership. But among the boundless questions the student researchers asked when starting the project was: Why are they losing limbs? As it turns out, “a small cut would lead to an infection in the arm or leg or toes, and then they would end up having to cut it off because of an infection,” Encinas said. And so began the students’ first foray into research. The team in 2016 decided the first thing it needed to do was to try to stave off the need for an amputation because of something as treatable as an infection. “We decided to go with wound infections (as the team’s project) since a high percentage of wound infections in developing countries end in death,” said Gabriela Calhoun, 3D printing biotechnology research team lead. The students decided to develop a low-cost, 3D-printed hydrocolloidal bandage – an adhesive bandage 2.0, if you will, that would aid in treating infections more effectively than a regular bandage or antibiotic creams. The GCU model is carboxymethyl cellulose-based, so it’s made out of a gel-like viscous substance that pulls in bacteria without letting it back out. “The positive impacts of a hydrocolloidal bandage vs. just a regular adhesive bandage is it’s 95 percent effective in wound infection prevention, whereas the regular bandage doesn’t have any preventions for wound infections,” Calhoun said. The surfaces of such bandages often are treated with medicine to aid in healing. The team’s goal was to make a better bandage, which meant trying to ply it with the best infection-fighting concoction it could. Encinas said the team decided on a homeopathic treatment because those essential oils and plant herbs are easy to find. Also, it avoids the red tape of drug regulation. What’s next for the team is further testing. Encinas said the team has used inactive strains of those viruses so far in its testing. “Because this is a university, we don’t want to have viruses that can spread here,” he said. The teams want to start testing the bandage on active strains to verify the research. After a year of refining the hydrocolloidal bandage, the team also has been developing a 3D-printed prosthetic with those many Rwandan amputees in mind. Calhoun said 2.4 million of the 3 million upper arm amputees are in developing countries, and so the team set its sights on creating a cost-effective prosthetic for developing countries. Build team members Ethan Nichols (left), Diego Revilla and Denisse Delos Santos test the prosthetic’s motor function. The student researchers launched the project after hearing about Rwandan amputees. Also, the student researchers wanted to make sure such a prosthetic actually would be used instead of just thrown into the corner, which meant making a lighter, more responsive, more comfortable limb. “A major issue with a lot of the upper arm prosthetics is 90 percent of the people don’t wear theirs currently because of the amount of weight it has and the amount of usefulness. It doesn’t benefit them because most everyday tasks are more difficult to do with their prosthetic limb on,” Calhoun said. 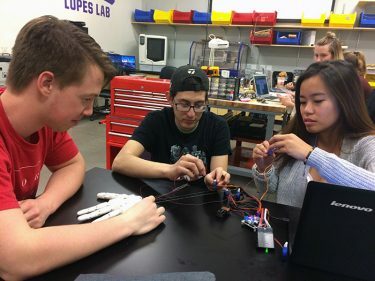 Build team lead Ethan Nichols was in the Lopes Lab on a recent Friday night, when the build and research teams usually meet, to work on the prosthetic arm prototype – currently, a basic prototype of a hand with different colored bundles of strings emerging from each digit. He and fellow build team members Diego Revilla and Denisse Delos Santos were huddled around a laptop where Delos Santos would adjust a program setting to move individual fingers. 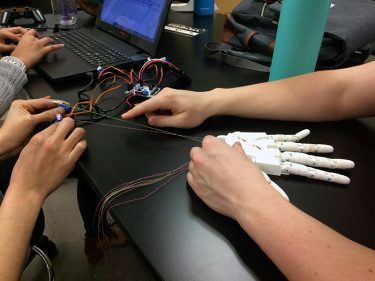 The fingers didn’t always move like the team wanted them to: “This is going to take so much fiddling,” one student researcher said with a laugh, obviously fascinated and excited by the progress on the project. Nichols said to make the hand as light as possible, the researchers adjusted the 3D printer settings to make the prosthetic more hollow and are using high-quality, lightweight fishing line. Encinas said many prosthetics incorporate heavy cords that allow them to open. The challenge is to create something more intuitive, and the way to do that is to incorporate microsensors. “We’re trying to create metrics surrounding comfort levels. With these prosthetics, what we’re looking for is something we can attach to anything, really. The big part of the design is how we attach it to whatever components the patient has, and then another part is to add sensors to this. How do we deliver power systems so that when you reach forward, it can sense … it will open for you rather than apply these big, heavy cords?” he said. The sensors would detect such environmental factors as temperature, for example. Using different settings on the 3D printer, the team was able to make a lighter prosthetic. Also incorporated in the design is lightweight fishing wire. The next step for the build team, before incorporating sensors, is to make every finger automated. That will involve using devices called servos. “Servos will actually be moving each finger instead of us pulling the string,” Nichols said. Calhoun added that the team’s hand is a “more functioning” prosthetic that looks more realistic when it’s used. One thing the student researchers didn’t consider in making the arm is cosmetics since there is a stigma surrounding robotics in developing countries. The hope is that this more realistic prosthetic will stave off some of that stigma. The team has gone beyond the science of these two related projects and has thought about the business behind what it’s doing. Calhoun said the team has considered following a model like that of Toms Shoes, which provides a pair of shoes for a child in need for every shoe purchased. In this case, it would be a bandage for every one purchased. The researchers also have talked with patent lawyers and built a website. What stands out in this research, Encinas said, is that it is being done at GCU by undergraduate students and not by a big corporation. This is goal-oriented research, he said, and not just research for the sake of research. For Nichols, beyond the big-picture considerations of trying to solve a problem in a developing country, beyond the value of having research on his resume, beyond the business considerations, it simply has been fun to work with 3D printing technology. “It seems like something straight out of science fiction that you can have a thing, put it down and, within a few hours, have an exact replica in your hands. It feels like it shouldn’t be real,” he said.